The USA has said it will suspend financial participation in the ITER experimental fusion reactor project due to cuts in the federal research budget. In its appropriations for fiscal 2008, Congress included only $10.7 million for US work on the project. The US financial commitment for ITER is $1.1 billion, and the Bush administration had proposed spending $160 million in 2008 to start purchasing components for the project. ITER is a joint international research and development project that aims to demonstrate the scientific and technical feasibility of fusion power. The partners in the ITER project are the European Union (represented by EURATOM), Japan, the People's Republic of China, India, the Republic of Korea, the Russian Federation and the USA. 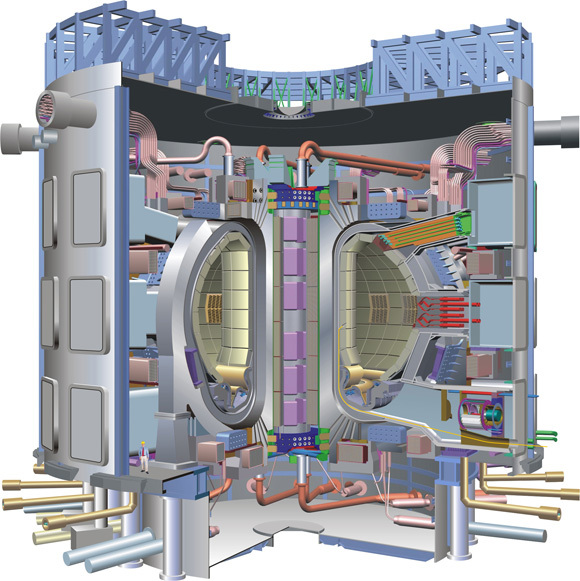 ITER will be constructed in Europe, at Cadarache in the South of France. The long-term objective of fusion research is to harness the nuclear energy provided by the fusion of light atoms to help meet mankind's future energy needs. This research, which is carried out by scientists from all over the world, has made tremendous progress over the last decades. The fusion community is now ready to take the next step, and have together designed the international ITER experiment. The aim of ITER is to show fusion could be used to generate electrical power, and to gain the necessary data to design and operate the first electricity-producing plant. In ITER, scientists will study plasmas in conditions similar to those expected in an electricity-generating fusion power plant. It will generate 500 MW of fusion power for extended periods of time, ten times more than the energy input needed to keep the plasma at the right temperature. It will therefore be the first fusion experiment to produce net power. It will also test a number of key technologies needed for a real fusion power station. Fusion is the energy source of the sun and the stars. In a fusion reaction, two light atomic nuclei fuse together to form heavier ones. 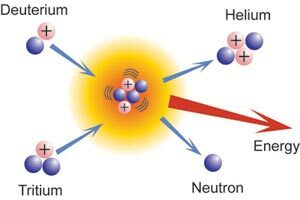 For example, one nucleus of deuterium and one of tritium fuse together to form helium, a neutron, and a large amount of energy. #1 Fusion is an almost limitless energy supply. The basic fuels are distributed widely around the globe. Deuterium is abundant and can be extracted easily from sea water. Tritium can be produced from lithium, which is readily available in the Earth's crust. #2 Fusion produces no greenhouse gas emissions. Fusion power plants will not generate gases such as carbon dioxide that cause global warming and climate change, nor other gases that have damaging effects on the environment. #3 Fusion is suitable for the large-scale electricity production required for the increasing energy needs of large cities. A single fusion power station could generate electricity for two million households. #4 Waste from fusion will not be a long-term burden on future generations. Only metal parts close to the fusion plasma will become radioactive. The radioactivity will decay over several decades and the metal can be reused after about 100 years. #5 No transport of radioactive materials is required in the day-to-day operation of a fusion power station, as the intermediate fuel tritium is produced and consumed within the power plant. #6 The fusion reaction is inherently safe. Only about two grams of fuel is present in the plasma vessel, enough for a few seconds of burn. As fusion is not a chain reaction, the reaction can never run out of hand. According to Greenpeace, uranium reserves are relatively limited and last week the Nuclear Consultation Working Group claimed that a significant increase in nuclear generating capacity would reduce reliable supplies from 50 to 12 years. In fact, at current consumption levels, known uranium reserves are predicted to last for 85 years. Geological estimates from the International Atomic Energy Agency (IAEA) and the Organisation for Economic Cooperation and Development (OECD) show that at least six times more uranium is extractable, enough for 500 years' supply at current demand. Modern reactors can use thorium as a fuel and convert it into uranium, and there is three times more thorium in the ground than uranium. Uranium is the only fuel which, when burnt, generates more fuel. Not only existing nuclear warheads, but also the uranium and plutonium in radioactive waste can be reprocessed into new fuel. There is more than enough uranium, thorium and plutonium to supply the entire world's electricity for several hundred years. Anti-nuclear campaigners claim that nuclear power contains hidden emissions of greenhouse gases (GHGs) from uranium mining and reactor construction. But so do wind turbines, built from huge amounts of concrete, steel and plastic. The OECD analysed the total lifetime releases of GHG from energy technologies and concluded that, taking into account mining of building materials, construction and energy production, nuclear is still a lower-carbon option than wind, solar or hydroelectric generation. During its whole life cycle, nuclear power releases 3 to 6 grams of carbon per kilowatt-hour (GC/kWh) of electricity produced, compared with 3 to 10 GC/kWh for wind turbines, 105 GC/kWh for natural gas and 228 GC/kWh for lignite (brown coal). Greens, exemplified by the Sustainable Development Commission, place their trust in carbon capture and storage (CCS) to reduce the GHG emissions from coal and gas plants. But carbon capture is, at present, a myth. There is no functioning power station with CCS in the world, and if it did work, it would still greatly reduce the energy efficiency of any power station where it is installed. With all power generation technology, the cost of electricity depends upon the investment in construction (including interest on capital loans), fuel, management and operation. Like wind, solar and hydroelectric dams, the principal costs of nuclear lie in construction. Acquisition of uranium accounts for only about 10 percent of the price of total costs, so nuclear power is not as vulnerable to fluctuations in the price of fuel as gas and oil generation. A worst-case analysis conducted for the UK Department of Trade and Industry (now the Department of Business and Enterprise), which was accepted by Greenpeace, shows nuclear-generated electricity to be only marginally more expensive than gas, and 10 to 20 times cheaper than onshore and offshore wind. With expected carbon-pricing penalties for gas and coal, nuclear power will be considerably cheaper than all the alternatives. Britain is not overwhelmed with radioactive waste. By 2040 there will be a total of 2,000 cubic metres of the most radioactive high-level waste, which would fit in a 13 x 13 x 13 metre hole, about the size of the foundations for one small wind turbine. Much of this high-level waste is a leftover from Britain's atomic weapons programme. The largest volume of waste from the nuclear power programme is low-level waste: concrete from outbuildings, car parks, construction materials, soil from the surroundings, and so on. Production of all the electricity consumed in a four-bedroom house for 70 years leaves about one teacup of high-level waste, and new nuclear build will not make any significant contribution to existing radioactive waste levels for 20-40 years. New reactors will be constructed from modular designs with the need for decommissioning built-in. The costs of decommissioning and waste management will be incorporated into the price of electricity to consumers. New nuclear plants are expected to have a working life of 40 years so the cost of decommissioning is spread over a long period. This is perhaps the most ironic of the anti-nuclear arguments, since it is the opposition of greens that will cause most of the future delays. The Canadian company AECL has built six new reactors since 1991. From the pouring of concrete to coming online, the longest build took less than 7 years and the shortest just over 4 years. Childhood leukaemia rates are no higher near nuclear power plants than they are near organic farms. Leukaemia clusters are geographic areas where the rates of childhood leukaemia appear to be higher than normal, but the definition is controversial because it ignores the fact that leukaemia is actually several very different diseases with different causes. It is purely by chance that a leukaemia cluster will occur near a nuclear installation, a national park or a roller-coaster ride. Clusters tend to be found in isolated areas where there has been a recent influx of immigration, which hints at a virus. Men who work on nuclear submarines or in nuclear plants are no more likely to father children with leukaemia (or any other disease) than workers in any other industry. More nuclear plants (in Britain and elsewhere) would actually reduce weapons proliferation. Atomic warheads make excellent reactor fuel; decommissioned warheads (containing greatly enriched uranium or plutonium) currently provide about 15 percent of world nuclear fuel. Increased demand for reactor fuel would divert such warheads away from potential terrorists. Environmentalists claim offshore wind turbines can make a significant contribution to electricity supply. Even if that were true, the environmental impact disqualifies wind as sustainable. The opening up of the North Sea continental shelf to 7,000 wind turbines is, essentially, the building of a huge industrial infrastructure across a vast swathe of ecologically sensitive seabed. Wave power is still highly experimental and unproven as a method of generating electricity. The cost overruns and time delays would make any problems of the nuclear industry look cheap by comparison. Since 9/11, several studies have examined the possibility of attacks by a large aircraft on reactor containment buildings. The US Department of Energy sponsored an independent computer modeling study of the effects of a fully fuelled Boeing 767-400 hitting the reactor containment vessel. Under none of the possible scenarios was containment breached. Only the highly specialised US bunker-busting ordnance would be capable — after several direct strikes — of penetrating the amount of reinforced concrete that surrounds reactors. And terrorists have already demonstrated that they prefer large, high visibility, soft targets with maximum human casualties rather than well-guarded, isolated, low-population targets. A huge limestone pit in southern France will soon host a big ring of burning plasma, an artificial sun ten times hotter than our real one. The pit will hold ITER, the International Thermonuclear Experimental Reactor, a collaboration between China, the European Union, India, Japan, South Korea, Russia, and the United States. Nuclear fusion is the energy source of the future. The heart of ITER will be a giant burning doughnut of ionized hydrogen and helium at 150 million K. The plasma will burn deuterium and tritium nuclei to form helium nuclei and spit out energetic neutrons that heat the walls of the reactor. In future reactors the heat will drive a turbine. 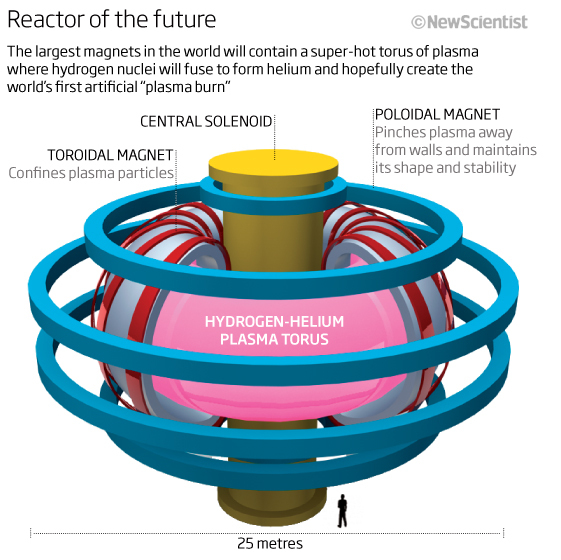 Containing the hot plasma means building several of the largest magnets in the world. The magnets will be cooled to around 4 K to become superconductors. Some of the coldest objects on the planet will be just a few meters from one of the hottest things in the universe. Fusion is much cleaner than fission. But it will still produce radioactive and toxic materials. To deal with this, the designers are developing a robotic system to remove and transport radioactive parts from the torus to a storage room and replenish the torus with fresh parts. ITER operators will use a VR system to control the robots. MIT nuclear scientist Dennis Whyte: "We are basically making a star on the planet." how to make safe and sustainable electricity via nuclear fusion. It could meet our energy needs and save the planet. "We will have to show it is safe ... Any disturbance from ideal conditions and the reaction will stop. A runaway nuclear reaction and a core meltdown are simply not possible." is injected into the tokamak, the spinning vortex will be heated up to 300 MK to form the inert gas helium as exhaust. ITER may go nuclear soon after 2030.